There’s one thing you need to know about the new Friday La Brunch at Iris – it’s not really about the food. Sure, there’s food on display and there is a nice selection of it, but dining is done at bar top tables, and two hours in, the DJ turns the music up so loud, it’s hard to hold a conversation. 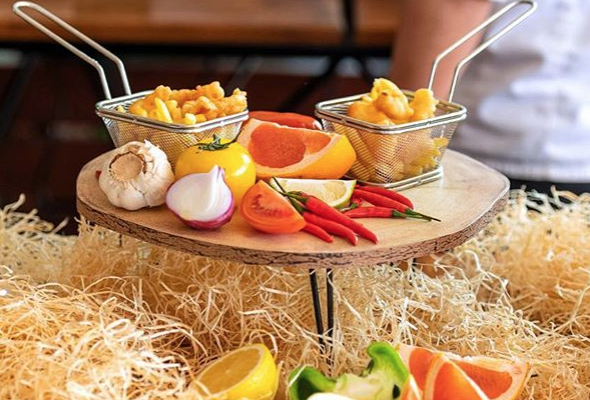 Yes, Iris’ brunch targets Abu Dhabi partygoers. The dress code appears to range from sequins to Doc Martens, with a hipster beard or two thrown in for good measure. Having said that, the selection of food on offer is still good. Tuck into a juicy lamb chops – grilled out on the patio along with chicken wings and giant prawns. There are also mini-servings of top-notch fish ‘n’ chips complete with tartar sauce – a welcome accompaniment, that’s rarely offered in Abu Dhabi. Iris does party brunch right, though, without the wasteful largess of other party brunches in the city. There are several drink stations, not a dozen, and while there is more than enough food to sample, it’s decidedly not over-the-top. The price is right too: premium packages for under Dhs300, something that is becoming increasingly harder to find. Highlights included the cheese and a salad bar. Think big juicy chunks of watermelon and feta, pineapple, quinoa, and chicken. Pasta and barbecue stations rounded out the offerings. Dessert was fun, too, featuring a soft-serve ice cream machine. The red velvet and carrot cake slices are well worth a try, too.